So I was, very encouragingly, discharged yesterday a whole 2 days earlier than first planned. Basically all the hospital were doing were keeping an eye on me and feeding me, all IV drugs have stopped, all tubes were out so I was good to go. I think it is fair to say that the BRI were just coming out of a Code Black bed crisis, but I felt under no pressure to leave and was happy to get home! So stocked up (eventually) with pain killers, recovery drinks and letters and sick note it was home in time to see the baby in the bath and get some proper food. So today I am 6 days post op, but have been told that I won’t retun to work for at least 6 weeks. What goes in in between? Well the biggest reason is the laperotomy that I had – a mid-line incision to get into my abdomen – which whilst not the largest I have ever had, is still about 7 inches long and held together with 21 metal clips which will need to come out from Monday. Three in total, the clipped laperotomy at the front and the wound drain and then the stitched wound formerly known as my arse hole! All of these need to heal. I spent most of today asleep. And sleep is a high priority to help the body heal. However you need to keep the body moving, so daily walks (which I failed on today) will be needed. Today I was knackered after breakfast a shower and getting dressed,stayed up for lunch and then slept for four hours! It is definatly a case of taking each day as it comes. 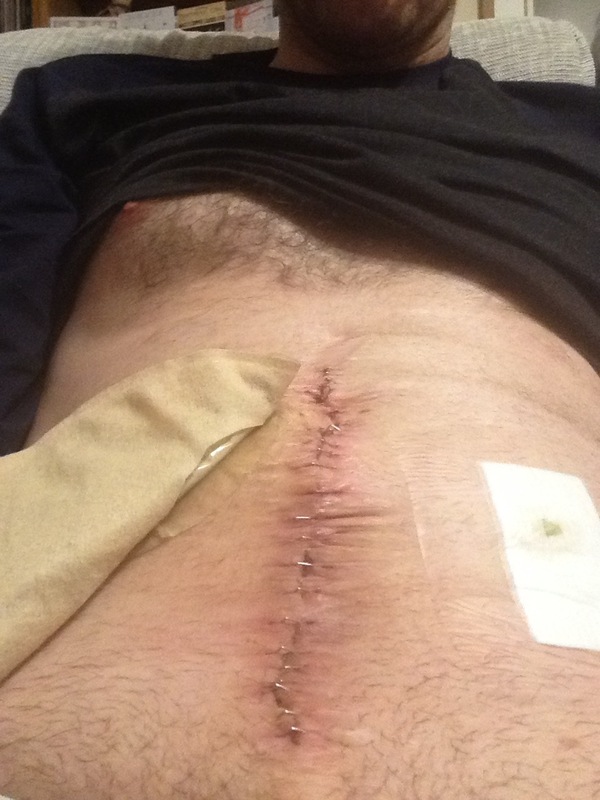 This entry was posted in ibd, stoma story and tagged #getyourbellyout, ibd, ulcerative colitis by doobarz. Bookmark the permalink. Remember this stage well. Hope the recovery goes well mate, thanks for the update!